I wanted to do a collage pop-up for my last day of the Paper Arts Series. So I surprised myself by making this card. My older sisters had Barbies, but I had Skipper, her plain Jane little sister. With no boyfriend, I might add. My friend Lisa had the Barbie Townhouse, and the Barbie Jet Plane. My Skipper doll hung out with the groovy, granola Sunshine Family. Life in the slow lane, for sure. 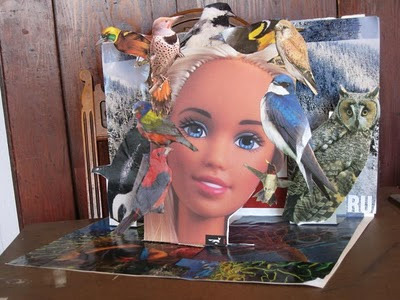 My friend Ann had, treasure of all treasures, the Barbie Styling head. A giant Barbie head that came with hairbrushes and make-up so that you could make her all pretty. I never got one. So when I found this giant Barbie in a big print sample book, I decided to decorate her my own way. I'm fond of the hummingbird earring and the wise old owl suggesting....what? There are brains behind the blonde? Note as well the bird of paradise perched just behind the woodpecker tapping on her head.